The Cash drawer Series is the latest offering from Posiflex and Value performanceRugtek. Boasting its high reliability and durability, the Cash drawer Series has screw-less tamper-resistant design and robust case. It inherits an embedded power coat anti-scratch finish that protects surface from wear and tear.The enclosure includes a patented "screwless" tamper resistant design. The CR-4000 Series is the latest offering from Posiflex. Boasting its high reliability and durability, the CR-4000 Series has screw-less tamper-resistant design and robust case. It inherits an embedded power coat anti-scratch finish that protects surface from wear and tear.The enclosure includes a patented "screwless" tamper resistant design. It offers adjustable 5 bill and fixed 9 coin compartments for general use and for the first time in India 8 Notes Cashdrawer to ease the cash collection and reliable performance in the most demanding retail environments. CR-4000: Printer driven, powered by printer or Posiflex system CR port, support 12V/24V voltage range. The Rugtek CR410 Cash Drawer is the latest value performance offering from Posiflex. Boasting its high reliability and durability, the Rugtek CR410 Cash Drawer Series has screw-less tamper-resistant design and robust case. It inherits an embedded power coat anti-scratch finish that protects surface from wear and tear.The enclosure includes a patented "screwless" tamper resistant design and are widely used in White goods, Food & Beverages, Telecom, Jewellery, Department Stores, Super/Hypermarket, Flower Shops. Drawer Metal cash drawerCasing Steel constructionFront Panel Steel construction with painted front default. Media slot Front access slot for check, credit card receipt or any paper. 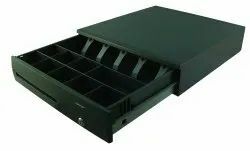 The CR-2020B is a quality compact cash drawer with flip top design making it ideal for environments where space is at a premium. This drawer is enclosed with aluminum die casting on the base and wear-proof stainless steel on the top. It offers fixed 6-bill and adjustable 8-coin compartments plus a cheque slot for non-cash transaction.